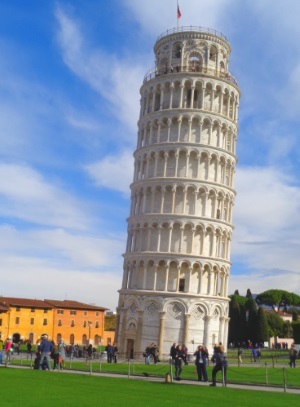 The Leaning Tower of Pisa 2019 - information for tourists and tickets. The Leaning Tower of Pisa is an attraction of superlatives. It is one of the most important sights in Italy. Every year millions of people come to see the building, which is inclined by about 4 degrees. Without the tower, Pisa would be a different city with fewer tourists. It is probably the most famous and most visited tower in the world. A tourist attraction of superlatives. Important: Only a limited number of visitors are allowed on the tower. Tickets are often booked out days or weeks in advance: On this website you can get the tickets in advance on the internet. The landmark of Pisa is about 56 meters high and some crooked. The tower leans about 4 degrees. It is the bell tower of the also very famous cathedral of Pisa. The construction of the tower began in 1174. The Leaning Tower of Pisa threatened to collapse for a long time. Therefore it was closed to visitors from 1990 to 2001. After the tower had been erected by 44 centimetres using a complex technical procedure, visitors have been able to climb the Leaning Tower again. This costs about 18 euros (in 2019) and is so popular that you often have to buy tickets weeks or days in advance. The problem: Unfortunately, 850 years ago, the architects of the Leaning Tower did not yet think that so many tourists would like to visit their tower. So there is only one narrow staircase. There is no other solution, the administration has to limit the number of visitors for safety reasons. Therefore there are only tickets for a certain date and time to climb the Leaning Tower of Pisa. Very often the tickets are booked for days or weeks in advance. The solution: If you know exactly on which date you are in Pisa at the cathedral, you can buy the tickets in advance simply in the Internet. The online tickets are available on the great website Getyourguide. Is it worth going up the Leaning Tower? Unfortunately, the entrance fee has been increased in recent years. We think it’s worth it anyway. From above, you have a great view to the church square Piazza dei Miracoli, the cathedral and much more. But above all, you will remember the climb to the famous tower of Pisa for the rest of your life. The Leaning Tower of Pisa is so famous that you cannot miss this sight. The Leaning Tower is for most tourists the main reason why they come to Pisa. You take part in a tour, which is limited to the cathedral incl. Leaning Tower etc. or you book a great city tour through Pisa with cathedral and tower. It is a freestanding bell tower, as is often the case in Italy. The Leaning Tower is the steeple of the famous cathedral of Pisa, which is well worth seeing. It is with 55 meters no particularly high bell tower (Italian Campanile) for such an important cathedral church. If the tower were not leaning, it would hardly be known. In the tower are 7 bells, which may strike since the erection of the leaning tower 2001 again. The construction of the tower probably began in 1174. The ground under the tower is partly clay. It gave way on one side already during the construction of the cathedral tower. After a long interruption, an attempt was made to continue building in the other direction. But this did not solve the problem. The construction was interrupted for a long time, only in 1372 the Leaning Tower of Pisa was completed. The façade of the tower of the Cathedral of Pisa is beautiful. It consists of the famous white Carrara marble. Carrara is a small town in Tuscany. The marble is the most famous in the world. Also, for example, the Cathedral of Florence, St. Peter’s in the Vatican and the former World Trade Center (terrorist attack 9.11.2001) have or had a facade of Carrara marble. Between 1990 and 2001 the bell tower was closed, even the bells were not allowed to ring. The reason was the acute danger of collapse. The Leaning Tower of Pisa was erected by 44 centimetres using a complex procedure. Now it is only 4 meters inclined. The building could have been erected completely, but this was not desired. The millions of tourists who come to Pisa every year because of the leaning tower were not to be lost. It is the big landmark of the city and for the majority of the tourists the main reason to visit the city of Pisa. Important: For safety reasons, only a very limited number of visitors may visit the Leaning Tower. Tickets are often booked out days or weeks in advance: On this website you can get the tickets in advance on the internet. Where’s the Leaning Tower in Pisa? The cathedral with the cleaning tower is a few hundred metres north of the city centre and north of the old town. From Pisa Central Station (south of the city centre) it is about 1.5 kilometres to the tower. More information about buses from the station to the cathedral can be found down on this page. It is unusual for Italy that the central church is not directly in the city centre. There are strict controls at the entrance to the Leaning Tower. It’s a bit like at the airport with metal detectors and so on. All bags have to be locked in a locker at the cash desk (also backpacks etc., free of charge). You should go to the Leaning Tower a little before your appointment. The most famous tower in the world is about 20 metres from its church, a wide footpath runs between the Cathedral of Pisa and its bell tower. Around the tower and around the church is a beautiful, well-kept lawn. The world famous square around the church is called Piazza dei Miracoli (square of wonders). The Leaning Tower of Pisa is a wonderful photo motif. The challenge is that the tower looks really leaning on the pictures. Every day you see hundreds of tourists taking photos or selfies. Many hold their hands vertically into the camera or stand at an angle to show the inclination of the tower in a funny way. This is especially popular with tourists from Japan, Korea and China. You can watch and, if you have a camera with you, take part. On the cathedral square there is a toilet (fee 80 cents) and a bookshop in the back area. There is no food and drink directly in the Piazza dei Miracoli, but there are many stalls, cafes, restaurants etc. nearby. For a long time it was thought that Bonanno Pisano was the architect of the famous leaning bell tower of Pisa. Today, the theory is more likely that Diotisalvi designed the tower in the 12th century. He was also the architect of the Baptistery on the opposite side of the cathedral. It was planned to build a church tower 100 metres high. In fact, after 200 years of construction, it was to be only 55 metres high. The foundation stone of the cathedral tower of Pisa was probably laid on August 14 in 1173. In the beginning, progress was quite rapid. Already after the building of 2 floors the cathedral tower swas leaning. The ground gave way on one side (clay and sand in the ground), but on the other side it was stable. After a break of almost 100 years, construction continued. The idea was to build diagonally and thus to compensate the inclination. The seventh and last floor was finally finished in 1319. After that also the bell room on top of the Leaning Tower of Pisa was finished (see pictures and film above), the tower construction was finally completed in 1372. 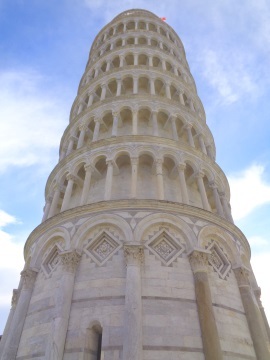 Actually, the Leaning Tower should have a height of about 100 meters, but it broke down at 55 meters. Reason was, you already suspect it, the enormous leaning of the tower of Pisa. Already at that time, the leaning tower in Tuscany was a topic of conversation in many parts of Europe. At the beginning of the 20th century it was possible for the first time to measure the skewness of the bell tower with millimetre accuracy. The result was a shock. The inclination increased constantly. It was now known that the tower would eventually collapse in the not too distant future. In 1990 the Leaning Tower was finally closed. Some scientists thought that the collapse was likely in the next few years. With steel ropes, heavy weights of lead, icing of the ground and some things more, more or less modern technology was used to prevent the collapse. The Leaning Tower of Pisa survived earthquakes and heavy rains in the following years. The breakthrough came at the end of the 90s. Holes were drilled in front of the stable side of the tower and large amounts of earth were extracted from the ground. So the stable side was destabilized as well. Thus the tower rose again a bit. Since 2001 the „Torre pendente di Pisa“ (Italian name) is considered safe again. Tourists can again go on the tower, the famous bells strike again. At that time, the inclination was reduced from about 5.5 degrees to 4 degrees or by 44 centimetres. Since then, the Leaning Tower has been slowly sloping again, but it will probably take at least 200 years for the bell tower to be inclined again by more than 5 degrees. The renovation was highly praised internationally and celebrated as a masterpiece of technology in the press. It would have been possible to erect the tower further or completely with this technology. But that was not what they wanted. Pisa and Tuscany would have lost a great attraction. 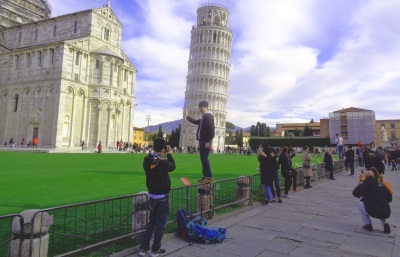 Millions of tourists want to see an leaning tower every year. They would probably not come any more if the Leaning Tower of Pisa was a vertical tower. For them, the building is nothing special: a little tower barely higher than the church itself (see picture). Nevertheless, it is one of the great sightseeings of Tuscany. The Leaning Tower is the bell tower of the famous cathedral of the city of Pisa in Tuscany. The 7 bells are at the top of the bell tower. By far the largest bell dates from the middle of the 17th century and weighs 2.6 tons. It carries the name Assuta (translated Assumption). The second very large bell in the Leaning Tower is called Crocifisso (Crucifixion) and dates from the 19th century. The only bell still dating from the construction period of the famous 13th century tower should also be mentioned. It has the name Pasquereccia and weighs about a ton. The other 5 bells are partly considerably smaller, the smallest bell weighs just 120 kilograms.